The Thylacine is more widely known as the Tasmanian tiger. 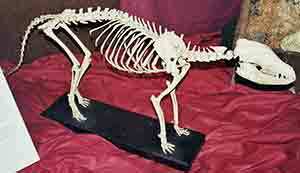 The thylacine (or Tasmanian tiger) was actually not like a regular tiger at all. It was a marsupial, meaning the female carried its young in a pouch (like the kangaroo). It looked like a wild dog and had distinctive dark stripes on its back. This photo was taken at the Tasmanian Museum and Art Gallery in Hobart. It gives you an idea of what the animal would have looked like. The Tasmanian tiger was a carnivore, meaning it was a meat-eater. What sort of meat did it go for? It seemed to like kangaroos, small rodents and birds. With its large powerful jaws, meat-eating would have been a breeze. It was a noctural animal, meaning it was active during the night. However it did also wander around in the day time. One of the well known features of the animal was the way it walked. It moved slowly but stiffly. Many people who have seen it comment on this unusual characteristic. The animal used to inhabit continental Australia. However, in the latter days of its existence, it seemed to be confined to Tasmania. How did Tasmanian tigers die out? Competition from the dingo (a wild dog still alive and kicking in Australia) was one reason. The animal was also viewed as a pest by farmers, and it appears that in the end, the thylacine was hunted to extinction. A tiger that is not really a tiger, extinct yet possibly still around? Definitely a famous Tasmanian!